Snowball Fight is a micro deckbuilding and deduction game for two players that only contains 18 cards. In the game players go head-to-head with their arsenal of snowballs in an attempt to be the ruler of the Blizzard Realm! In Snowball Fight each card has two possible actions, one on each half of the card (top and bottom). The action a player takes each turn depends on the direction they play the card. The game is played in two phases, a quick Drafting phase where players build their initial arsenal and then the Snow Assault phase where there is all out war! Play is simultaneous and players try to attack each other with an arsenal of snowballs, slushballs, and the dreaded iceballs and snow covered rocks while also trying to dodge attacks and build up their weaponry! This game was developed for the 18 Card MicroGame Contest 2015 on Board Game Geek! Snowball Fight won the September 2015 24 Hour Contest over on Board Game Geek! The original version of the game was completely designed in 24 hours. Since then the game has gone through some minor changes and new artwork has been created, but the core game is still the same. 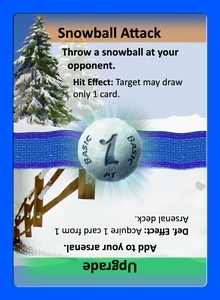 Snowball Fight placed second out of 72 entries in the 2015 18 Card Microgame Contest on Board Game Geek. Snowball Fight is Protospiel tested.